Bentonite-sand mixture is often used as the artificial engineering barriers for the high-level radioactive waste repository and the anti-seepage barriers in civil geotechnical engineering, and it is very important to study its deformation and permeability characteristics in evaluating the service performance and durability. The compression test was used to obtain the compression deformation characteristics and saturated hydraulic conductivity of the mixtures with different sand content saturated on salt solution of different concentrations. The concepts of the actual effective stress pe and the montmorillonite void ratio em are introduced, and the change rules of em-pe relationships and the em-k relationships of the mixtures with different sand content saturated on salt solution of different concentrations are summarized. 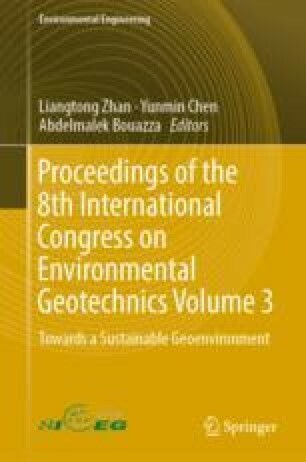 The authors are grateful to the National Sciences Foundation of China (Grant No. 41572284) and the Open Research Fund of State Key Laboratory of Geomechanics and Geotechnical Engineering, Institute of Rock and Soil Mechanics, Chinese Academy of Sciences (Grant No. Z013008) for the financial supports. At the same time, The authors thank the support of Shanghai Key Innovative Team of Cultural Heritage Conservation.